While it can be a lazy writer’s crutch to defer too readily to biography, the course of Polish artist Alina Szapocznikow’s extraordinary and painful life is integral to understanding her awkward, restlessly experimental and often darkly hilarious art. A potted history of her life would include the early deaths of her father and brother, her imprisonment during World War II in Auschwitz, Bergen-Belsen and Theresienstadt, her studies in art schools in Prague and Paris after the war and finally her tragic death from breast cancer at the age of 47 in 1973. The exhibition at Broadway 1602 – comprising drawings, photographs and sculptures – is a far from comprehensive retrospective of her career, but does present an intimate introduction to an artist whose work has not been widely seen outside Europe. 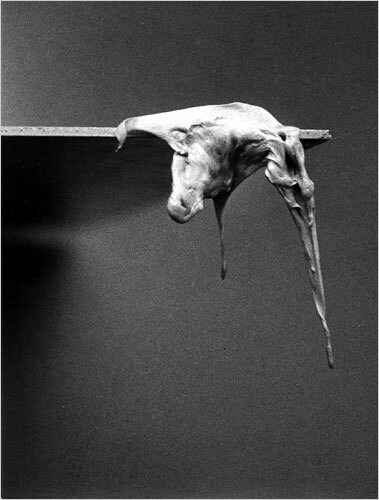 The visitor is greeted with a display of Szapocznikow’s 1971 ‘Photosculptures’; black-and-white photographs of stringy gobs of chewing gum fixed to concrete or wooden perches, stretched and distended so that the abject white gum takes on the louche composure of a Francis Bacon figure reclining on a couch. The stark and elegant photographs are accompanied by a typewritten text describing the artist’s epiphany that ‘an extraordinary collection of abstract sculptures was passing through [her] teeth’. That Szapocznikow claims this happened when she was ‘tired with polishing for hours [her] Rolls-Royce made of Portuguese pink marble’ points to the artist’s wryly humorous relationship to the polarised value system that the work operates within. Her subversive interest in the democratic potential of art-making and ownership developed some years earlier, in sculptures designed to be mass-produced for the home. Lampe-Bouche(Lamp-Mouth, 1966) and Ventre-Coussin (Belly-Cushion, 1968) turn polyester resin casts of red-painted lips and multicoloured bellies into Pop-ish home furnishings. Offering something like the comfort of a kiss or a hug, they have a sensual allure that evolved heartbreakingly into the ‘Cendrier de Célibataire’ (Widower’s Ash-Tray) series made a year before her death in 1972 – including a polyester cup cast from two breasts, and photographs of cigarettes pressed into sticks of butter. The lump-in-the-throat moment of the exhibition comes with a shaky untitled drawing from the same year, showing a female figure contorted on a bed, a cartoonish scar replacing her left breast. ‘Aaa! Aaa!’ is scratched out in a speech bubble above. In the adjacent Last Drawing from the Hospital, dated a year later, the figure turns as she crawls away from us to wave and scream a silent message. One gets the feeling that for Szapocznikow, who made the fickleness and fragility of the human form the subject of her life’s work, the disintegration of her body was something unflinchingly anticipated, but ultimately no more bearable than it would be for anyone else.